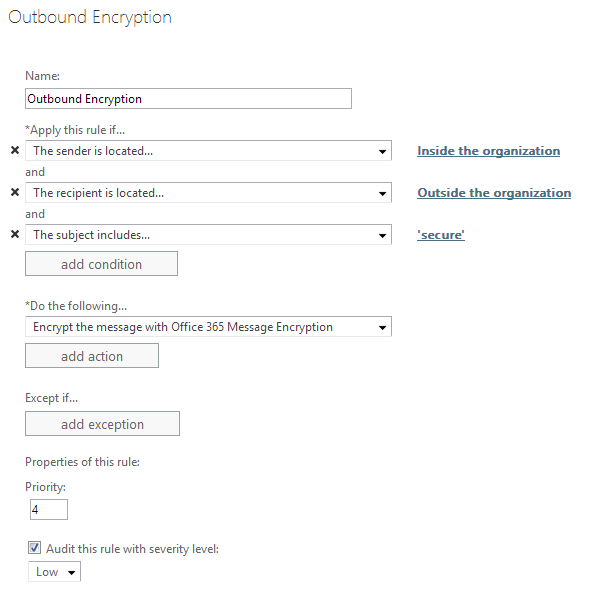 Back in November of 2013, Microsoft announced Office 365 Message Encryption (OME) as a way to protect the contents of outbound messages to people in other organizations. This excellent update helps fence in it's predecessor, Exchange Hosted Encryption (EHE), to the Office 365 branding and management. Users of EHE had to work through more cumbersome configuration steps and were required to purchase it open volume licensing, whereas OME comes included as part of Azure Active Directory Rights Management (AADRM) in the E3 and E4 packages, or purchased as an add-on to other enterprise SKUs with the normal subscription licensing. Unfortunately, the scheduled release date is a broad "Q1 2014" and there are still some small missing details, like "How do I friggin' enable this stuff?". Search results for OME are flooded with news articles announcing the service and irrelevant posts about EHE, and the only TechNet articles are for EHE customers who are currently being migrated to OME. However, it is possible to enable the service if you already have access to AADRM and are prepared to do a little PowerShell work. The very first thing we need to do is activate your Azure Rights Management functionality. Log in to https://portal.microsoftonline.com (you'll need to be a Global Admin, obviously). Click the big activate button (it's hard to miss). Import-RMSTrustedPublishingDomain -RMSOnline -name "RMS Online"
Assuming you get back an "OVERALL RESULT" of "PASS" from that command, then you are good to move on to the next step. However, It may take 12-24 hours for the licensing to start working in Exchange admin center. NOW we are ready to create some encryption rules! This can be done in PowerShell, but it is much easier from EAC. OME works based on rulesets that an admin creates and you can specify what criteria you want to use for messages. Or you can simply encrypt everything leaving the organization. Make sure you take a look at Microsoft's TechNet article on the user experience before you do this though - you could very well wind up with users at your door with pitchforks otherwise. We typically configure the rule to only fire when sending external mail where the word "secure" is in the subject line, so that's how I'll demonstrate this step. You may prefer a different trigger, and there's lots to choose from. Click the Admin button in the top-right next to your name and select Exchange from the drop-down. If you are accessing a tenant as a delegated admin (e.g. Microsoft Partner), then you'll need to navigate to the EAC by hitting service settings on the left-hand menu and selecting Manage additional settings in the Exchange admin center. Once in the EAC, click mail flow on the left-hand menu and you'll be taken to the rules page by default. Click the 'plus' sign on the rules page. Set the rule to apply if the sender is located outside the organization and the recipient is located inside the organization. Technically this will apply the rule to all inbound mail, but it won't do anything unless that e-mail was encrypted anyways. 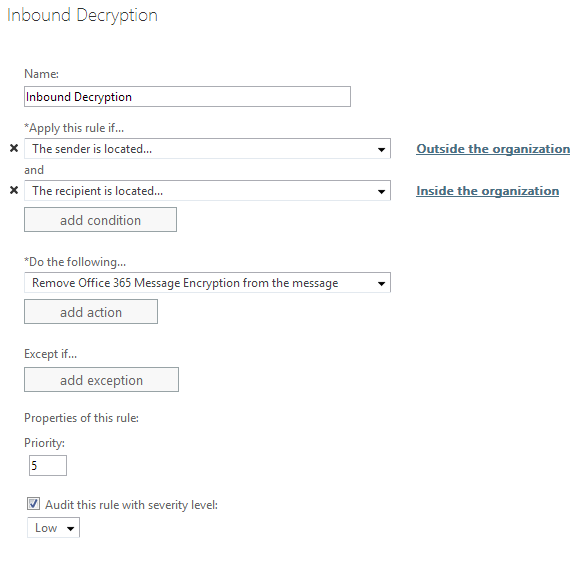 Enjoy your Office 365 Message Encryption! Feedback welcome! Special thanks from across the pond to ahandyblog for the write up on IRM that helped me fill in the gap there.